After days of a very public stalemate, the epic war of wills over the future of The Simpsons may be settled soon, as both sides realize that they are, respectively, a ridiculously wealthy and heartless corporation who should show some shred of humanity by sharing the tiniest crumbs of its billions in merchandising with the people who made it possible, and an incredibly well-compensated cadre of voiceover actors who already earn millions for jobs they can do in their sweatpants and then get home before sundown. 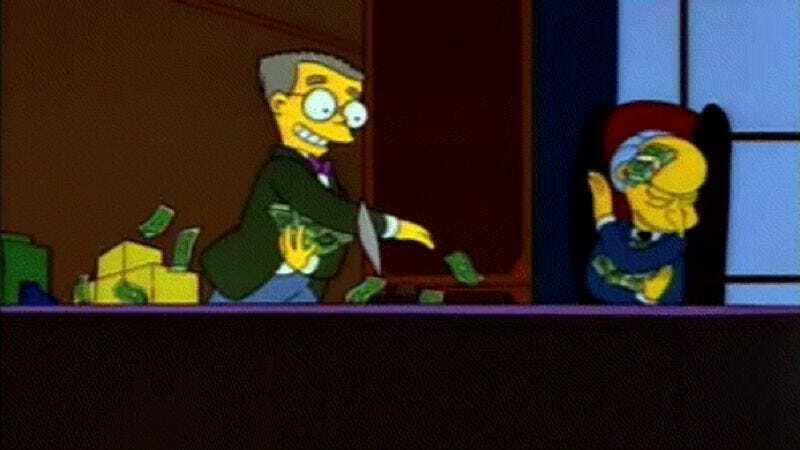 Ha ha, no: As with this whole argument, it all comes down to a slightly larger share of an already enormous profit, and according to a report released by aptly named financial analyst David Bank, Fox actually stands to benefit quite a bit if The Simpsons ends, to the tune of around $750 million in additional syndication revenue. That’s because canceling The Simpsons finally opens the door to selling the show to cable channels as well as local broadcast affiliates, which would give Fox and News Corp. a “massive windfall”—and as Deadline posits, that pretty much gives News Corp. all the leverage here, leading them to suggest that the cast will likely come to a new agreement “as early as next week.” But of course, that windfall would be even greater the larger the Simpsons stockpile becomes, so there’s some argument for keeping the show on the air as long as possible, hoarding stories about Homer upsetting and then reconciling his marriage to Marge the way other survivalists hoard gold. So in the end, we imagine both the rich people and the really, really rich people will reach a compromise ensuring everyone stays really, really, really rich.